Mobile analytics company Flurry has published an interesting report. A comparison actually of the sales figures of the first generation iPhone, Motorola Droid and Google Nexus One during the first 74 days since these phones were first released. And guess what? The report found out that sales of the Nexus is nowhere near the outstanding sales achieved by both Droid and iPhone. Apple managed to post its 1 million units sold on its 74th day of being released. 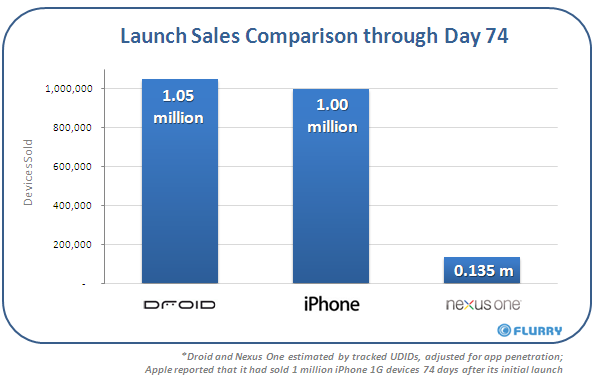 This is the reason why Flurry decided to measure the same for the Nexus One to see how far its sales went after 74 days. Unfortunately, Google’s first major venture into the mobile phone market is an epic fail with the Nexus One managing to get only around 0.135 million units sold. Interestingly, the Motorola DROID managed to post the most number of units sold during its first 74 days of becoming available in the market with 1.05 million units sold. Can we now conclude that Google’s first venture into the selling and marketing of mobile handset is an epic fail? Before we do so, we might want to consider first how these three phones were made available. For all we know this might have affected the Nexus One’s sales performance. Apple has its brick and mortar stores scattered across the states which helped Apple in selling the iPhone. This is in addition to its online store. For Motorola Droid, this was distributed by Verizon Wireless. While the Nexus was only made available for purchase online through Google’s web store. Even if it was released under T-Mobile contract plan, Google did not allow T-Mobile to distribute the phone on their own. Of course we all know that Google’s undermanned web store and even its online technical support for Nexus One is inadequate to answer all kinds of user queries. This could have led to user disappointment as well as discouragement from getting the phone. Is the Nexus One an epic fail? I don’t think so. It didn’t meet market expectations, yes I believe so. But Google has all the time in their hands to amend this fail. In fact, it is starting to do so now with the release of the AT&T version of the Nexus One.